» The Human Development Index (HDI) is a composite statistic of life expectancy, education, and income per capita indicators. A country scores higher HDI when the life expectancy at birth is longer, the education period is longer, and the income per capita is higher. It is used to distinguish whether the country is a developed, a developing or an underdeveloped country. » The ease of doing business index is an index created by the World Bank Group. Higher rankings (a low numerical value) indicate better, usually simpler, regulations for businesses and stronger protections of property rights. 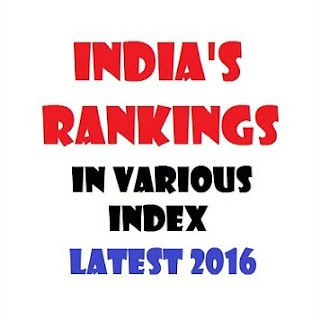 » India maintains top spot in Consumer Confidence Index 2016. India was followed by the Philippines, Indonesia and Thailand. » The CPI currently ranks 178 countries "on a scale from 100 (very clean) to 0 (highly corrupt)." » Denmark is least corrupt with the score of 91 while north Korea and Somalia is the most corrupt nations with the score of 8. The list is topped by North Korea, followed by Uzbekistan and Cambodia. The list is topped by USA, followed by China and Japan. The list is topped by USA followed by Hong Kong and China. The list is topped by Germany, followed by Luxembourg and Sweden. The list is topped by USA, followed by UK and Germany. The list is topped by Switzerland, followed by Singapore and USA. The list is topped by Switzerland, followed by Sweden and UK. The list is topped by Sweden, followed by Denmark and Netherland. The list is topped by Island state of Vanuatu, followed by Tonga and Philippines. The list is topped by Switzerland, followed by Singapore and Luxembourg. The list is topped by Argentina, followed by Bosnia & Herzegovina and Switzerland. The list is topped by Finland, followed by Norway and Switzerland. The list is topped by Sweden, followed by Denmark and Norway. The list is topped by Hong Kong, followed by Singapore and New Zealand. The list is topped by Norway, followed by Denmark and Iceland. The list is topped by New Zealand followed by Singapore, Denmark. The list is topped by Norway, followed by Sweden and Finland. The list is topped by Iceland, followed by Denmark and Austria.